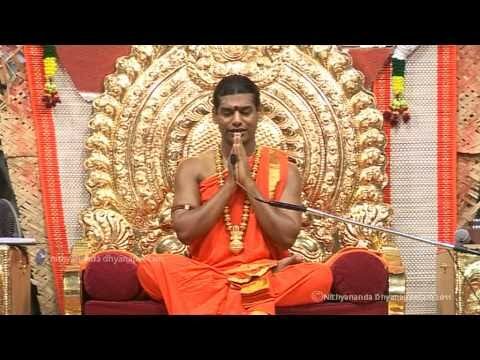 PARAMAHAMSA SRI NITHYANANDA on Choosing Joy over Worry! IF I were to tell you that you choose your worries that make you suffer, you will disbelieve me. That is the truth! Each one of us carries our personalised version of worry. Undoubtedly, the commonality of this worry is that we each have our personalised laundry list. Our worries are not the same as our neighbour’s. Our worry is completely based on our perceptions. Worries are based on individual desires. Sarah was moving to a new house. She watched over the movers pack her household articles in preparation of her move. One man was handling her antique vase and she warned him, ‘Please be careful, that is over a hundred years old’ The man looked at her and said, ‘Don’t worry ma’am, I will handle it like it is brand new’. Possessions and desire to possess bring about most of our suffering. Greed fuels many of our worries. We are bothered when our neighbours and friends possess things we do not have. If a neighbour has bought a new refrigerator it increases the temperature in our kitchen! When a friend buys the latest model automobile, we immediately feel that our last year model looks like a vintage car. Our desires are plenty. When these desires are unfulfilled, we begin to worry. Our worries do not arise from a genuine need for what we really require. We create and invent new wants by comparing ourselves with others. Desires, by themselves, aren’t harmful. If our desires are deep and pure, then they become true. Such a deep, true desire has power. Desire is energy. We all have a problem here. Our desires are borrowed. They arise out of jealousy and greed. We develop the desires by comparing with others. Our desires have no connection with our true needs. Ramana Maharishi, a realised master, explained the nature of desires with clarity: The Universe can cater to the needs of every single inhabitant. However, it cannot fulfil the wants of even a single person. We worry about everything. We are trapped in a circuit that leads from desires, to worry, to greed. Every time we are worried or stressed about something, we are generating an energy block. Look within instead of around. Stop craving for what others have. There is no need to renounce what you have to reach spiritual freedom. It is enough if you renounce what you do not have. Renounce your fantasies to possess what others have. Enjoy what you already have. This is the path to eternal joy, Nithyanandam.